It is almost impossible to believe that when the potato was brought from South America to Europe it was met with suspicion, dislike and fear. Potatoes were considered to be unfit for human consumption; only good as animal fodder or for the starving. The upper classes, who recognised the value of the potato long before the masses, went to great lengths to try to get peasants to cultivate them; King Frederick II of Prussia even threatened to cut the nose and ears off any peasant who did not plant potatoes. Yet today, what would life be like without the humble spud? Who can imagine steak without chips? Bangers without mash? A baked dinner without a golden roasted potato? But there are more uses for this South American tuber than just good eating. Out of eye makeup remover? Never fear – just peel off a bit of potato skin and use the inside of the peel to wipe your eye area. Your makeup should come off easily. While you're at it, grate a little raw potato and wrap it in cheesecloth. Place it over your eyes every morning for five minutes. This remedy is sure to banish dark circles from your eye area as potatoes contain enzymes that naturally lighten the skin. If you've been cutting up berries and now have purple fingers, potatoes are the perfect solution. Simply rub at the stains with a peeled, raw potato and they will come off. Use water to finish the job. You can also use raw potatoes on berry stains on clothing – just rub it on your clothes and rinse. Next time you get a little sunburn at the beach, don't reach for the aloe vera or vitamin E cream; reach for a potato instead. 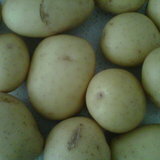 Peel and finely dice a small potato and then use tap water to make a thick paste. Apply the paste to the burn and leave it for a few minutes. If your head is pounding, then you need a potato! Slice a raw potato in half and place a piece on each temple, rubbing gently until the pain dissipates. Who needs panadol? There's a lot of folklore around this one, but basically you rub a piece of cut potato on your wart daily and it will go away. Don't wash off the juice. The science behind this one is that it works because raw potatoes are full of potassium, vitamin c and iron. So there you have it, 5 bizarre uses for a potato. And if they don't work, at least you can always use the left-over potatoes to make a delicious potato bake. Yum! Why? Because there is more to spuds than just good eating! My eldest sister used to have stomache ulcer every time she was stressed. Someone told her the best natural remedy for that is potato juice. She blended a raw potato each morning and drank it before breakfast for a few days. The taste was horrific but the stomache ulcer pain was so much worse. Not only did it get rid of the ulcer, she never had ulcers again. To soften brown sugar that has gone hard in the container, put a small piece of raw potato in the container and in a short time the brown sugar will be manageable again.